Alright - today is the first day of the blog series! 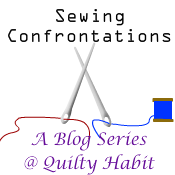 Every Friday of this month, 1 (and sometimes 2) bloggers will be sharing a post on their blogs about a sewing challenge (or confrontation, if you will) that they put themselves up to. It can be something they have been wanting to try, or something they want to improve. You can read a more detailed explanation here. My Goal: To inspire YOU to try something new, tackle something you've been putting off, or improve a sewing or quilting related skill! Confession: I am often more worried about getting a project DONE than executing my technique well. There, I said it. Example A: I started to make a Luigi pillow from Cut to Pieces' Super Mario Brothers QAL. I'm SO excited to finish this project for Christmas (though I can't reveal anything final yet). Today, I have some in-process pictures to show you my challenge. The squares you need for these blocks are 1.5". Yikes. I'm not used to cutting so small. I seriously considered changing up the size just to make it easier on myself, but that would have made my pillows HUGE (I'm glad I didn't!) Luckily, I got over that momentary weakness and started cutting. These are unpressed, but you can see they are the same size! And as I cut and sewed the other squares, they built up and I could see a difference. I know these are also unpressed so it doesn't look that great, but I could tell. I will be posting a look at my final Luigi pillow at the end of the month for the link up- hopefully the seams match up! Now, with all of my projects, I'm making the extra effort to cut as well as possible. Every. Single. Time. 3. Use sharp blades. Those things can become dull if you cut a lot (duh!! But seriously, you might not really think about it!). I try to change mine with every big cutting project (like a quilt). For the pillow, I realized I didn't know how long it had been since I had changed mine (bad) so it was time. And when I changed it, I noticed the difference instantly. You get a sharper, more accurate cut - just watch your fingers! They can be expensive but I find them worth it - I get mine from Amazon, though I'm sure there are cheaper places out there (if you know of one, let me know in the comments!). You can also buy a rotary blade sharpener, though I have never used one, so I can't accurately describe how good they are (again, tell me in the comments!). 4. Use proper lighting. This goes along with number two. I often sew at night and I live in a tiny apartment, so I am in the process of setting up another light to use in my sewing space. If you can't see, you're going to make mistakes. I made sure, when cutting for my Luigi pillow, that I did it during the day time (and sewed at night). 5. Finally... don't cut fabric when you are tired! Seriously! Don't do it! Leave it for another time/day. Goes with #1. I've redone the bottom two rows since this picture. The others actually LOOK the same size! How about you? What are you going to work on in November? The link up will be right here on Nov. 30, and you can post to win fabric... so start working on your project (it does not have to be finished!! See you next week for Rebecca's post (which, incidentally, coincides quite well with mine)! it is so true. don't cut when tired! my very first quilt was a group project. i volunteered to do all of the cutting because i was so nervous i'd mess up the sewing. And guess what? Cutting is the most important part sometimes! ha. joke was on me. Oh, I especially agree with number 5. My 10 month son has been up for an hour several nights lately, and I think, why don't I do some sewing? After the first night where everything I cut was incorrect I told myself I can only sew things that are easy to take apart. Great post, Jess - all important reminders! Great advise on not cutting when you are tired. I try to do it after dinner sometimes after a whole day of work and make so many mistakes. Now I reserve that for the weekend. Way more accurate. accurate cutting is definitely something I need to try to improve. I've never changed my rotary blade so I don't think I'm doing myself any favours there!